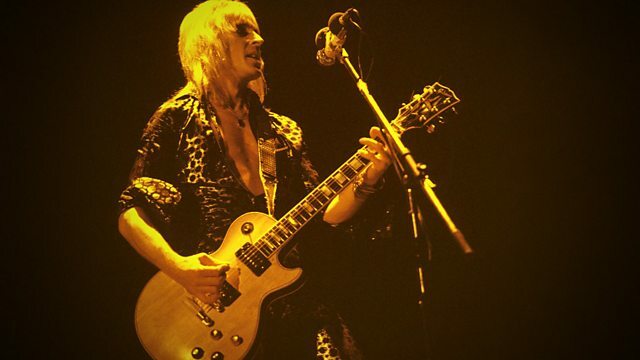 Gary Kemp and guests praise the work of Mick Ronson, one of the UK's most celebrated guitarists and producers, who rose to fame as David Bowie's guitarist during his Ziggy period. Gary Kemp marks the 20th anniversary of the death of his guitar hero Mick Ronson with a celebration of his career. With a stellar guest list of musicians and fellow Ronno fans including Chrissie Hynde, Tony Visconti, Ian Hunter, Trevor Bolder and Woody Woodmansey, Gary explains why Mick is such an important figure in British rock n roll, highlighting the important contribution Mick made to some of the most acclaimed albums in rock history and why his talent deserves to be celebrated. Mick rose to fame as lead guitarist and music arranger on David Bowie's albums, The Man Who Sold The World, Hunky Dory, Ziggy Stardust, Aladdin Sane and Pin Ups. Through his work with Bowie, Mick came to the attention of and subsequently worked with some of the biggest names in rock. Mick co-produced Lou Reed's Transformer album, enjoyed a stint with Mott the Hoople and then became a long-time collaborator with Mott's former leader Ian Hunter. Mick was also a member of Bob Dylan's 'Rolling Thunder Revue' live band, and can be seen both on and off-stage in the film of the tour. He also made a connection with Roger McGuinn during this time, which led to his producing and contributing guitar and arrangements to McGuinn's 1976 solo album Cardiff Rose. Roger Daltrey employed Ronson's guitar on his 1977 solo release One of the Boys, and in 1979 Ronson and Hunter produced and played on the Ellen Foley debut album, Night Out, with 'We Belong To The Night' and the hit single 'What's a Matter Baby'. In 1982, Ronson worked with John Mellencamp on his American Fool album, and in particular the song 'Jack & Diane'. In 1992 Mick produced Morrissey's album, Your Arsenal. The same year, Ronno's final live performance was at The Freddie Mercury Tribute Concert.